Nationals have come and gone and what an experience it was! A heartfelt thank-you for all your wonderful support. The good wishes, attending the trivia night, donating items for the silent auction, and the financial contributions were so very much appreciated by me, Jim, and most especially Max. Without it, he would not have been able to go to Saskatoon. Here is a brief rundown of how he did. Max won his first match. They were fairly evenly suited and it was a great fight. (the fellow that he beat finished up placing forth). Max’s second match was to the son of a five-time Olympian and the Romanian champion. (in the picture) Max was doing awesome and holding his own but in the end, he got caught in a hold and ended up passing out. 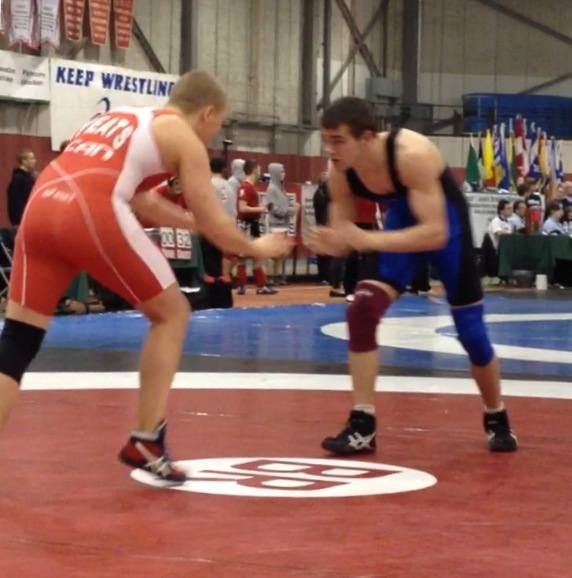 His opponent continued on to claim the silver medal. Max’s third round was unfortunately only twenty minutes later. Even though he had not fully recovered he was somehow still dominating (these guys were all so big) after rolling the guy seven times. His was almost assured a win but during a split second lapse in concentration he got pinned and lost the match. Max finished up ranking 8th out of many in the weight category above his own (his weight category was cut). He gave it 100% leaving nothing in the ring and was satisfied with his performance. You win some, you lose some. Overall, a character building experience. My catch phrase that I have always said to the kids during stressful performance situations – “it’s not like you’re going to get beat up or anything” – didn’t apply in this case (as Max dryly informed me). It’s all well and good to go toe to toe against muscled mutants ten pounds heavier than you are who are trying to beat the snot out of you (at a national competition in front of crowds of people), concentrate on intricate technique and speed while being contorted into positions that defy logic and sense – but really, it’s very hard on the mother! At the end of it all my throat hurt and my nerves were shot. Just sayin’.